Autistic and Pregnant Autistic Mum Life: What to do when you find out you are pregnant. What to do when you find out you are pregnant. and if you are feeling anything like I was then you are feeling a whole lot of emotions varying from immense happiness to crushing self-doubt. In those first few days after seeing those two blue lines my emotions went crazy. Yes, some people will say that's the hormones but it's also the realisation that your whole life is about to change and no matter how prepared you are, change is scary for everyone but especially those with autism. Don't feel guilty or shy away from your emotions. Accept your emotions and remember that there is no 'right way' to process this information and if you feel able to why not open up and share your thoughts and feelings with your partner. The chances are they are feeling the same wild mix of emotions too. As this is a practical guide I will now share with you the necessary things to do now that you know you are pregnant. Please note that different areas operate different policies and this guide relates to my personal experience. Sharing the news with someone you trust is important. I shared my news with my best friend, Beth. I chose her as i knew she would be happy for me but that she would also listen and validate my concerns. Telling people you are expecting can be a wonderful experience but in these early days when you aren't sure of your emotions it's best to tell a small number of trusted people that aren't going to bombard with screams of 'congratulations' and start showering you with baby gifts- there will be time for all that later. I chose to make an appointment with my gp as I prefer face to face conversations rather than over the phone but in hindsight it was a bit of a wasted appointment. All that was required from me was to fill in a midwife referral form at the reception desk and wait for an appointment through the post. 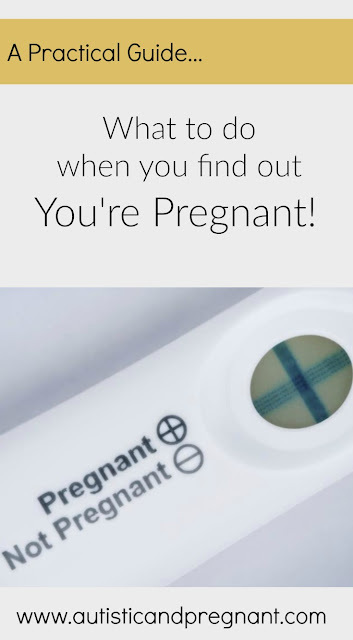 If you feel comfortable telephoning the doctors and telling them you are pregnant then go ahead but if you would like to chat to someone or have any thoughts and concerns you need to share then make yourself an appointment. There is no shame in asking for some extra reassurance and support but be warned, the lack of information available about autism and pregnancy may led to you being dismissed. A gp said to me that 'autism and pregnancy are completely unrelated'. This is untrue as my autism effects every aspect of my life and I hope that this web site can help to raise awareness of how autism and pregnancy impact each other so as autistic women we can feel supported and reassured by the medical professionals helping us through our pregnancies. Many of the older generations of women within my family were surprised that the gp didn't take a urine sample to conduct a pregnancy test. I am told that it is no longer common practise to confirm pregnancies at a gp's surgery as today's home testing kits are so accurate that gp's just take your word for it. It's never too early to start to look after both yours and your babies health. I started to take a pregnancy multivitamin when we decided to start trying for a baby. This enabled me to incorporate it into my daily routine and therefore made me less likely to forget it when it mattered but don't worry if you've not done this, now you know you're pregnant start taking a daily pregnancy suitable multivitamin. In the early stages you are advised that you only need folic acid but I decided that a multivitamin would be easier in the long term and I felt reassured that all my needs were covered with just one tablet. Check what you can and can't use. Some medications are completely off limits during pregnancy as they may damage your unborn baby. The same applies to certain foods. Minimise the risk to yourself and your baby by familiarising yourself with what you can and can't use. I referred to the nhs website for my information as all too often people would share information that was outdated and no longer valid. If you are on long term medication then you will need to speak with your gp about whether it is safe to continue to take. Frustratingly you may not get a definite answer and you may have to consider whether coming off your medication is the right decision for you. My personal experience of this decision making process can be found here. My social difficulties extend beyond the real world and into online discussion forums. I'm not very good at connecting and I have never actually posted on the forum I frequent but I have found the information helpful. I have found it very reassuring to read along with other mums at the same stage as I am. I find it useful to know what other's are experiencing, it helps to put my own experiences into perspective and understand what is happening to my body.